Dermatitis Herpetiformis – also known as DH or Duhring’s disease – is a chronic blistering skin condition. It is characterised by very itchy bumps or blisters usually localised on elbows, knees, buttocks and scalp. This rash is linked to Coeliac disease, that is why people suffering from this condition need to follow a strict gluten-free diet. Dermatitis Herpetiformis can be diagnosed with a skin biopsy. If you are diagnosed with Dermatitis Herpetiformis, your doctor may prescribe an antibiotic for short-term relief from itching. But this treatment has serious side effects. It is then recommended to use a companion care to moisturise, soothe and help repair irritated skin. Less than 13 ingredients. Hypoallergenic. 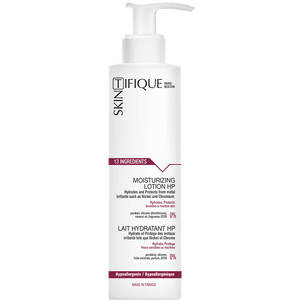 A limited number of ingredients: Skintifique products have extremely safe and pure compositions, with a limited number of ingredients to minimise the risks of unwanted skin reaction. The Eczema & Dermatitis pack contains less than 13 ingredients. Each ingredient has been carefully selected for its safety profile. All our products are hypoallergenic and tolerance tested. Natural ingredients: The Eczema & Dermatitis pack includes 1 tube of Hydrating Gel Plus HS and 1 bottle of Moisturising Lotion HP. These products contain 98.9% and 78.8% natural ingredients. These are photos of a woman suffering from dermatitis on both hands due to a Nickel allergy. After using the Protective Cream HPS to protect her skin against contact with Nickel, the Moisturising Lotion HP to moisturise her skin by day, and the Hydrating Gel Plus HS to repair her skin by night, a very clear improvement can be seen. * 35 patients with dyshidrotic eczema (dermatitis) associated with nickel allergy: After 2 weeks of medical treatment, some patients used either Skintifique products or standard products for 2 months. The improvement or deterioration of their condition has been evaluated by the doctors conducting the clinical study. Enables a controlled and gradual release of the active ingredients. When the skin requires moisturising, eg because it is dry or inflamed, it sends signals to the delivery system containing the active ingredients, which then releases the ingredients. And so the skin’s physiological needs are met instantly and long-lastingly. The world’s first technology to protect the skin from metals like Nickel, Chromium, and Cobalt, to which many people are allergic. 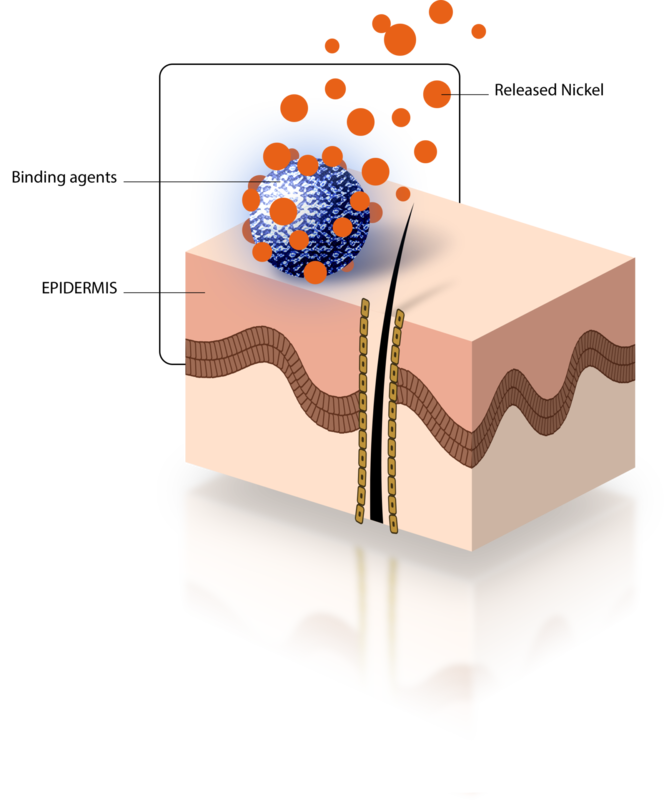 Similar to UV protection, this new technology captures metal ions on the skin’s surface and prevents them from penetrating the epidermis. "I am a big fan of the Eczema Pack by Skintifique. I was tired of trying new products without seeing any improvement on my skin, but it's over now : I found Skintifique ! I love the complementarity of these two products. 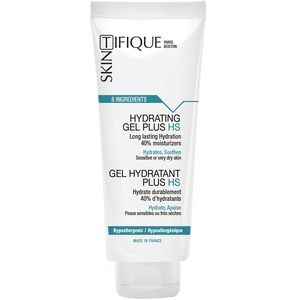 I use the Moisturizing Lotion during the day and the Hydrating Gel at night to moisturize and soothe my skin.​"
"For more than 2 months now, I have chosen French products Skintifique which are formulated for allergic skins, with an excellent composition. These products have far-reaching hydrating, nourishing and protecting effects. The results are here: I have no more dyshidrosis, no more eczema and my skin is reconstructing as I continue to use these products." "During my eczema crisis, I used less corticosteroids cream than the previous times, before I started using Skintifique’s Gel. 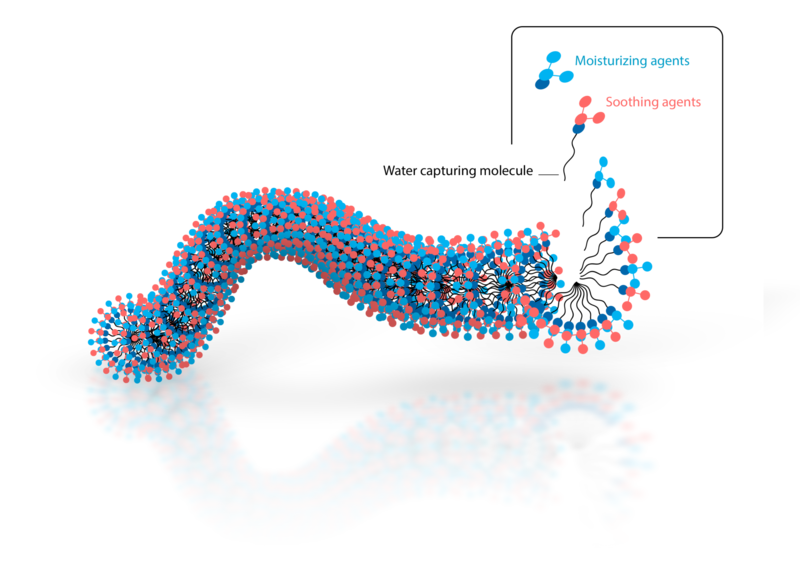 I have less crevices, that are less deep also. My everyday life is less painful. I feel my skin is reconstructing, in a better shape now. I see the real benefit of having an intense and lasting hydration on my hands." What is eczema? How to relieve eczema? How to manage your eczema everyday?